Free Hugs at the Harbour Hug-a-Thon is a hugging marathon and this is an open invitation to anyone who needs a hug and a friend; which is all of us. Your connection and conversation with someone who is struggling with grief, loneliness, depression, trauma, illness or despair on this day could save their life. It will certainly put a smile on their face and change their day for the better, lighten their burden and give them some hope. WHY A HUG - A -THON ? Because there's nothing nicer than a hug, a laugh and a chat when you're feeling down. A hug, a laugh and a chat are wonderful things to share when you're feeling great as well. Hugs are feel-good medicine for everyone, in every situation! We know, without a doubt, that a lack of human connection is a major contributing factor to the current mental health crisis in Australia. When you feel that no-one understands your struggle, when you feel that you're a burden on others, and you can't see a way out of your pain, the consequences can be devastating. Way too many Australians are suffering mental and emotional pain every day and we lose way too many friends and family to suicide. Our Hug-a-Thon aims to address this lack of connection; to unite people for a morning of caring, kindness and compassion in action. It's all fine and well to raise awareness and money, but real human connection is special and action is what's needed more than anything else right now. You can't underestimate the power of a hug, a smile and a kind exchange - it has the potential to create miracles in people's lives. 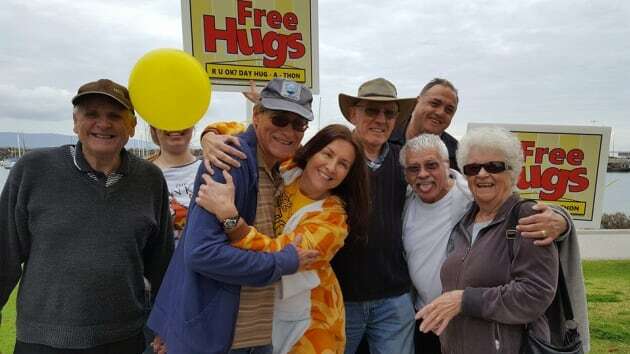 Hug-a-thon-ers will be holding "free hugs" placards to signify that they are offering free hugs, so if you want a hug, find one of these people and start hugging. If you want to be a hugger, come let one of us know. We'll give you a sign then all you need to do is start smiling at people and ask if they would like a hug. You can also make a "free hugs" sign of your own and come join us. If you have a "Free Hugs" t-shirt, please wear it. If you're thinking this sounds like fun but are too scared to come do this with a bunch of people you don't know, I guarantee you'll be greeted with the openest of arms and I'll personally give you the biggest hug. This is an informal and FREE community event. No donations will be asked for. There will be nothing to buy. It's about creating the human connections that are key to good mental health. Stay for as long or as little as you like. Bring your breakfast to the harbour. Bring your children before school. Pop in on your way to work or after you drop your children at school. Please share this event with everyone you know and let's make it a huge and beautiful morning.